Provide comfort for the family of Melvin Kerr with a meaningful gesture of sympathy. It is with sadness that we announce the sudden passing of Mel at age 86 at his home where he lived for the last 50 years. Predeceased by his best friend and wife of 53 years Dorothy (2007). Father to Bruce (Tammy), Michael (Jamie), and loved grandfather to Kristen, Jamie, Allyson, and James. Born in Central Butte, Saskatchewan with twin brother Mervyn (1986), Verna, Fred and Millie (2013). 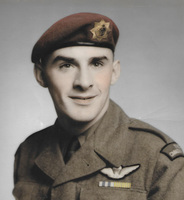 Mel moved to Brantford in 1950, joined the Royal Canadian Regiment 1RCR from the London Barracks, travelled to South Korea and fought in the Korean War from March 1952 until April 1953. He received his Wings August 1953 and was honourably released September 1954. He married Dorothy Berry on March 13, 1954. He worked at Ford in Oakville for a few years then worked 33 years at Gates Rubber where he retired in 1994 making many lifelong friends. “The Mayor of Eagle Place” as Dorothy used to say to him, he knew just about every person that drove by and lived on his street. Always willing to lend a hand to anyone that needed it; if your lawnmower didn’t start he’d fix it and tell you what was wrong. He loved his neighbours and sitting out on the front porch where he was happiest with a drink in hand. Thanks to Andy the next door neighbour for watching out for him and keeping an eye on his well being. He will be sadly missed by his McDonald’s coffee buddies as well as all the people at Kingswood and Brantford Family Restaurant. Friends will be received at the TOLL FUNERAL HOME, 55 Charing Cross Street, Brantford on Wednesday, April 3, 2019 from 2-4 & 7-9 p.m. As per Mel’s wishes there will be no funeral service. Donations to the charity of your choice appreciated.